In the colourful world of Candy Cabs, everything is black and white. DO YOU SEE? A curiously brief (only three episodes) BBC One series about a firm of women-only cab-drivers, it feels instantly familiar, very predictable and extremely undemanding. These could be either good or bad things. The 'comedy drama' - ahh, that term - is set in a fictional picturesque part of the north west of England, and according to Lisa Millet, who plays lead character Elaine, and writing on the BBC Comedy blog, it's a "deliberate move away from the 'it's grim up north' approach". Oh. She also writes that there's "something for everyone" - especially, you might suggest, if that 'everyone' mainly refers to 'women who like their TV fluffy'. 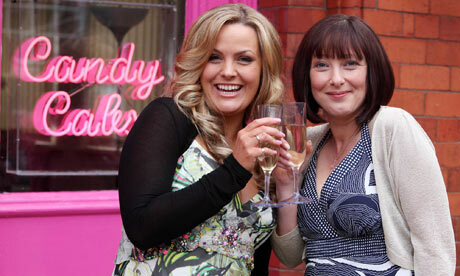 Millet is joined by Jo Joyner - better known for chronic misery over on EastEnders - and they play business partners who take on the challenge of running a new cab company, even after their best friend Shazza, and third business partner, dies suddenly in Asda. There's no time for talk about cash flow, or a quick check of how sound their business plan might be - mere details! - because instead they've got hen nights to attend! Guests of a footballer's wedding to collect! In fact, there are japes aplenty. Elaine and Jackie preside over a team of women cab drivers and their lives and loves and pick ups, and the cabs themselves seem to take equal star billing - six pinky people carriers, with frequent shots of all them lining up in a row. Given that the cabs probably took up most of the budget, it's probably important we see them frequently. But it's a pickle of a plot - all soapy and northern and strong women with plenty to say. Most importantly perhaps, at least if you're Claire Sweeney, it gives Claire Sweeney one of her first major telly roles in recent memory, complete with authentic Scouser accent. She is also seen frequently in her underwear - a fitness DVD cannot be far away. Her character, Mandy, gets to say half-funny lines to the male characters like, "You still here - hanging around like a bluebottle on a wedding cake?" She plays the 'gobby one', you see, and completes a line up of ladies that also includes a 'fat one', 'man eating one', and a 'panicky one' (that's our Elaine, breathing deeply into a rubber glove to stop a panic attack, while on a big wheel prior to scattering Shazza's ashes). There's sentiment and emotion at regular intervals, while the various men in the women's lives are all hopeless and trouble-prone, or not quite telling the truth about stuff. They are similarly broad character sketches too - moody but lovable husband, ne'er do well cad, conniving business man and commitment phobe. The show's trying hard to reach out to the audience and connect with them - and it kind of pulls it off, if you don't look too hard, and assume the audience is a mass group of pre-hen night women after a glass of white wine and with low expectations. So if we're having to pigeon hole this along the lines of 'chick-lit' or 'chick-flick', let's go for 'cab-lady-fict', say, and, as it looks quite nice, has mostly chirpy performances from a decent cast, you can forgive this cheesy breezy life-affirming gurning grin of a programme.